As quickly as National Selection Regatta #1 flew by, so has National Selection Regatta #2. Time flies when you’re going fast. NSR #2 events included the men’s pair, men’s double, women’s double, lightweight men’s double, and the lightweight women’s double. The lightweight men’s pair raced as a speed order event. With NSR #1 and #2 wrapped up, we’re one step closer towards naming the 2013 United States Men’s and Women’s National Rowing Teams. What does the NSR mean? The winning boats gain the opportunity (if they choose to accept) to compete at one or both of the upcoming World Rowing Cup events, and with a top four or top half finish, earn a berth on the U.S. National Team that will compete at the 2013 World Rowing Championships August 25-September 1 in Chungju, South Korea. 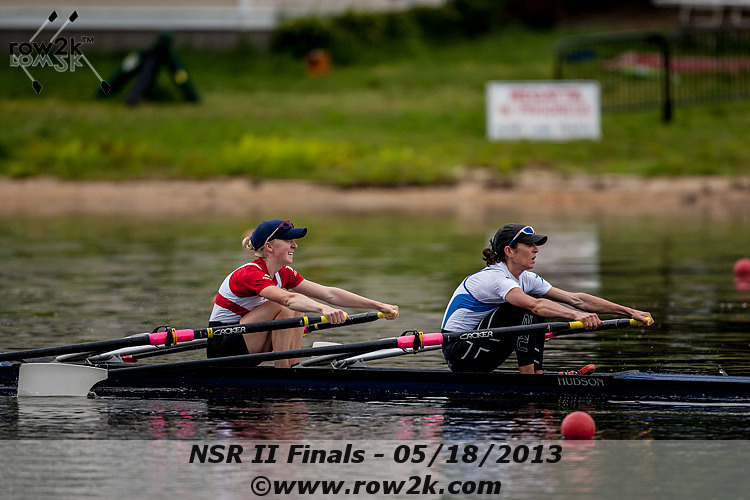 Like NSR #1, NSR #2 also featured top performances from the men and women at the United States Training Center. The Men’s Pair featured an all USRowing Training Center A Final with the six boats finishing within less than ten seconds of each other. If I hadn’t already been in the cool down area cooling down from my own race, I would have loved to have seen this grueling hard-fought 2,000-meter race between the Training Center men. 2012 bronze medalist from the Men’s Four, Henrik Rummel paired up with 2012 Team Alternate Mike Gennaro to take first place ahead of Seth Weil and London Olympian Grant James in second, followed by London Olympian Steve Kasprzyk and Max Goff in third. 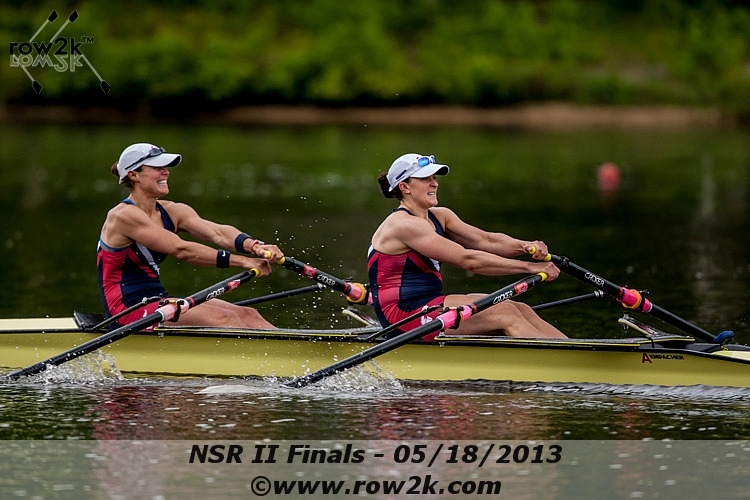 There were only five total entries in the Women’s Pair, all from the USRowing Training Center. After a second place finish in the Time Trial behind Vicky Opitz and Felice Mueller, Taylor Goetzinger and 2012 gold medalist from the Women’s Eight Meghan Musnicki took first in the A Final, switching places with Opitz and Mueller who crossed the line less than two seconds later in second place. Grace Luczak and Lauren Schmetterling took third. It was another tight finish with the top three boats separated by about only two and half seconds. The Men’s Double didn’t include any Princeton Training Center athletes, as the USRowing Training Center in Princeton is primarily a sweep camp for the men. Shoutout to Willie Cowles and fellow Virginia grad, Matt Miller from Potomac Boat Club for taking first place. The Women’s Lightweight Double was a lot of fun to watch. It wasn’t that it was a tight finish like the men’s pair and women’s pair, it was the dominating factor in which three-time national team athlete and silver medalist (who used to row open-weight), Kate Bertko and London Olympian, Kristin Hedstrom won the event. These are two experienced scullers who know how to move the boat and have teamed up for the first time (literally, their first row together was just a couple of days before the NSR #2 Time Trial). I’m super pumped to see this boat continue to come together and what kind of speed they put up internationally. The United States hasn’t medaled the lightweight women’s double since Sydney 2000 (Bronze; Christine Collins / Sarah Garner). Watch out Rio 2016. The Lightweight Men’s Double was won by composite entry of Malta Boat Club’s Colin Ethridge and Vesper’s Peter Alter. The Lightweight Men’s Pair was another speedy race. In an all USTC-Oklahoma A Final, top pair Robin Prendes and Anthony Fahden won the event as well as the overall percentage (GMS = Gold Medal Standard) of the regatta with a time of 6:46.16. To put it into perspective, their time would have put them in 5th place in the heavyweight Men’s Pair A Final, beating out 8 other boats. Nicely done. Last, but certainly not least…the Women’s Double was won by 2008 Beijing Olympian Ellen Tomek and myself, Meghan O’Leary from the Princeton Training Center. We finished about five seconds ahead of the composite entry of London gold medalist Esther Lofgren rowing for Potomac Boat Club and four-time National Team member Stesha Carle, rowing for California Rowing Club. Composite entry of USTC-Princeton’s Liv Coffey and Vesper Boat Club’s Grace Latz took third. 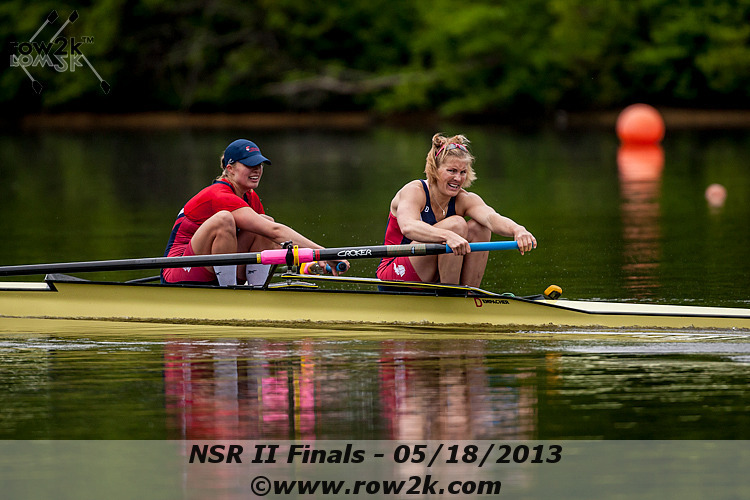 On a personal note, racing and winning my first NSR #2 was a thrill. When is winning not exciting? In the timeline of achieving goals, it was step one toward making my first National Team. Tomek and I will go on to race at the World Cup in Lucerne, Switzerland to hopefully qualify and then race at the World Championships. As a boat, we have a lot of potential and speed to gain. I’m excited to see what we can do with a little time and more racing experience. As with many of the other crews coming out of both NSR #1 and #2 as well as all of the athletes at the Training Center, we return to the water and the weight room without skipping a beat. It’s already been a grueling week of training filled with the ups and downs that rowing bestows upon us. Time to work harder than ever. Congratulations! I knew you would be successful. Good luck with your next level. Wishing you the best.